Nevada and Oklahoma became the 29th and 30th states to require ignition interlocks after a first drunk driving offense. Louisiana is one of those states that require the driver to blow into a device which measures their blood alcohol content. If the person is legally drunk, the car will not start. From 2006-16, there were 2.3 million halted drunk drivers due to the interlock, according to Ron Replogle, law enforcement manager of Mothers Against Drunk Driving (MADD). In just 2016, 348,000 drunk drivers could not start their car! The result is that the number of drunk driving deaths in America have fallen 51% from nearly 21,000 in 1982 to only 10,265 in 2015. MADD deserves credit for this plunge in alcohol related deaths, since it has been the major advocate for ignition interlocks to reduce drunk driving. Florida debated a similar law this year, but did not pass it. Florida recorded 797 deaths due to drunk driving in 2015 - 103 more than the previous year, the biggest percentage jump of any state. Currently, Florida requires the ignition interlock only after a second drunk driving offense. The question is why didn't Florida vote to impose the interlock after a single offense? And why haven't 19 other states passed similar laws? First-time offenders have driven drunk an average of 80 times before they are arrested! 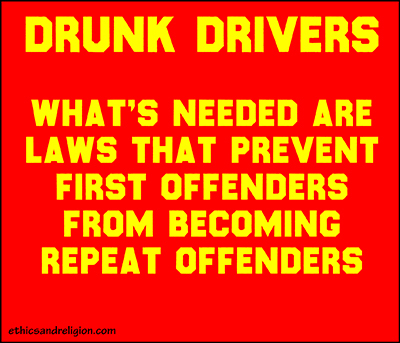 What most other states do is suspend the drunk driver's license for a first offense. However, 50% to 75% of convicted drunk drivers continue to drive on a suspended license. Many states like Florida require the interlock only after a second offense. Alcohol-impaired driving fatalities accounted for 29% of the total traffic deaths in 2015. Two-thirds of the 10,265 killed were due to drivers with a BAC of .15 or higher - double the usual drunk driving level. One bright spot in this story is that the number of persons under age 21 killed in drunk driving crashes decreased 80% from the record high of 5,215 in 1982 to only 1,021 in 2015. What's needed are laws that prevent first offenders from becoming repeat offenders, so that more lives are saved. Mothers Against Drunk Driving was founded by Candy Lightner in 1980 after her daughter was killed by a repeat drunk driving offender. Few people have had such an impact in saving lives. MADD is now the largest nonprofit fighting to end drunk driving. It also works to reduced drugged driving and has supported more than million victims of these violent crimes. MADD has helped save 340,000 lives as it has cut drunk driving in half! How effective are ignition interlocks? New Mexico and Arizona were among the first states to pass laws requiring those convicted of one drunk driving offense to install an ignition interlock in 2006 and 2007. In the decade since their drunk driving deaths have fallen 30%. These devices cost drivers an initial $75 to $100 for installation and then $2.15 a day or $785 over a year. That's not a small sum, but think of the saved lives. Here are the 20 states that do not require the ignition interlock after a first offense: California, Florida, Georgia, Idaho, Indiana, Iowa, Kentucky, Massachusetts, Michigan, Minnesota, Montana, New Jersey, North Carolina, North Dakota, Ohio, Pennsylvania, South Carolina, South Dakota, Wisconsin and Wyoming. It is time for the people of those states to demand that their state legislatures pass a law requiring an ignition interlock after a first offense. A great step to save thousands of lives!.